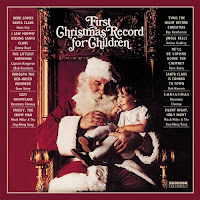 We have quite a few Christmas CDs playing during this season, but this is one of the very favorites: First Christmas Record for Children. It was first released in the early 40's and 50's, and it contains music from such legends as Doris Day, Rosemary Clooney, Gene Autry, and even Captain Kangaroo. Famous names aside, my husband enjoys the nostalgia from this childhood favorite, and my children love the songs and poems. The whole "record" just feels like old-fashioned Christmas. Listen or buy it at Amazon.